A cookbook with over 100 vegetarian recipes for the home cook from the studio kitchen of world-renowned artist Olafur Eliasson. 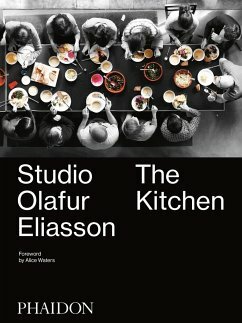 Discover the act of cooking and eating in a creative environment with Studio Olafur Eliasson: The Kitchen. Featuring over 100 vegetarian recipes cooked at Olafur Eliasson's studio kitchen, these recipes have served as nourishment and source of creative inspiration and communal discussion every day for his staff, artists, and guest collaborators, including René Redzepi and Alice Waters. Foreword by Alice Waters, who has cooked in the kitchen, and shares Olafur's vision for cooking and eating together as a daily connection that inspires. Olafur Eliasson is an Icelandic-Danish artist. His work ranges from installation and sculpture to photography, film, and built environments, and has been exhibited worldwide in institutions such as MoMA, Tate Modern, and the Venice Biennial. He works and lives in Copenhagen and Berlin. Alice Waters is the executive chef, founder, and owner of Chez Panisse, in Berkeley, California. She is an American culinary pioneer, maintaining that cooking should be based on the finest and freshest seasonal ingredients, produced sustainably and locally. She is the author of the bestselling cookbook The Art of Simple Food and other influential books.